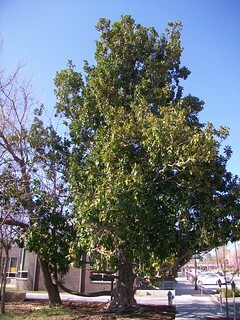 “Mother Tree”, a magnolia on Block St. In Fayetteville, Arkansas, there is a special tree downtown. It’s huge compared to most downtown trees, and even compared to most trees in people’s front yards and wooded areas around town. But despite its size, I thought I could hide it from a world which may chop it down someday to make room for office buildings. No, there’s no hiding this tree. People pass it every day on Block Street, and some even sit beneath its branches or use the lowest-hanging branch as a natural bench. My guess is that this tree is safe from harm for now, and rather than hiding it from the world, I should encourage more local residents to get to know Mother Tree. Whenever we find land for Ripples’ mission, we hope to plant seeds from this beautiful magnolia and nurture her seedlings. I have so much to learn about magnolia trees! 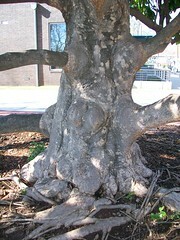 A large trunk seems to reflect the female form in some places. Mother Tree makes me feel peaceful, and is often my refuge when things aren’t going well for Ripples. She tells me to be more patient by the way she’s been there, in the same spot, for longer than I’ve been alive. She tells me to be more flexible when her seemingly immobile branches sway in a breeze. She doesn’t use any words, but still I feel a message radiating out from her trunk. Be well, keep striving higher, don’t be afraid, listen to intuition. More often than not, her advice is what ends up being the right thing to do. 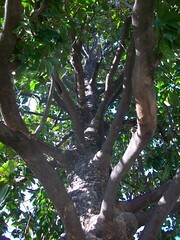 This wonderful tree has helped me heal from surgery and other illnesses in the past year. She’s lifted me up and also humbled me whenever necessary. I think she brings out the wisdom inside me, so it doesn’t get tangled in the details of work and life. When the sunlight plays tag with her leaves and envelopes my face, it’s a dance that makes me aspire to be so much more than a working woman. She gives great hugs, too. Her branches are situated in such a way as to create “cuddle spots” when, how can I say it, one’s rump fits perfectly in the curve of a branch that also angles itself just slightly towards the trunk, with a younger branch the width of a forearm on the opposite side of the body. I hope many more people get hugs from Mother Tree in the years to come, and that the community decides to keep her around for the duration of her life. Even after her death, her saplings will be growing outside our earthbag house somewhere, someday.